Geargrinders | Examining automobiles of the past and present. I feel like the Genesis brand gives me a taste of what it was it was like to see brands like Lexus, Infiniti, and Acura trumphiantly prosper out of otherwise more value-oriented automakers. I wasn’t alive then to see the birth of those of brands, but I am alive to see Genesis, the Hyundai spinoff. 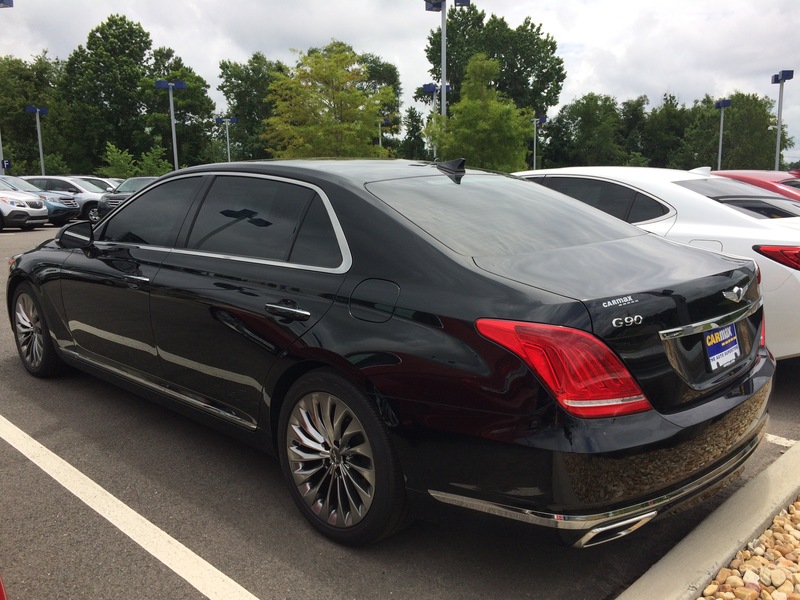 The monolithic G90 is the flagship of the two car line-up. Disappointingly, theres little stylistic differentiation between it and the smaller G60. The G90 is, however, a handsome car both for its sheer size and restraint. It looks very chunky and substantial, a look created by the blunt nose and deliciously long and flat hood. It is very nondescript aside from the giant, drainage-grate grill. Nonetheless, there are some interesting touches on the exterior of the car, both good and bad. In particular, I found the taillights quite attractive but despised the flat piece of glossy plastic in the middle of the grill. Though neccesarry for the sensors used in driving aids, its like designers didn’t even try to hide it. Fit and finish is excellent; trim is laser straight and the door shuts very fluidly and heavily in this age of thin metals and plastic. The interior is one of the most interesting of any car I have sat in. It is as big inside as the visual weight of the car is on the outside with a very wide center console. The console is probably one of the first things I noticed when climbing in the car, it is festooned with all kinds of shiny buttons and knobs along with a padded leather armrest. The second thing I noticed was the white analog clock; I love analog clocks in cars, especially luxury cars. The dash was wide with nice, thick strips of wood and the speaker grills and gauges had a polished, metallic look to them. It all made it feel like a seriously high-end automobile, fortunate because it made up for some uncomfortable front seats. They not particularly soft and had an extremely intrusive headrest, one of those that jams your neck foreword out of a resting position. Bolsters, head rests, and back support was configurable, yet I could not find a pleasing combination. When I began to adjust the steering wheel tilt to my preference, it blocked the top part of the instrumentation; this really is a car for tall-statured individuals. I looked around my shoulder into the sunshaded confines of the rear seat, noticing it had its own button riddled console. Said console, trimmed in beautiful wood and stitched leather, had its own climate and seat controls. This car makes you feel like someone important; angle the seat back and stretch you legs far in front of you while viewing yourself in the lighted flip-down mirror. Before parting ways with the massive Genesis, I appreciated one last element of its elegant restraint in the way it quietly mentioned its 5.0 liter V8 in subtle trunk-lid badging. This is a very grandiose car and an extremely impressive beginning to the Genesis name. I am not only well-impressioned by the lavish G90 itself, but am glad to have seen the birth of an exciting new luxury brand. 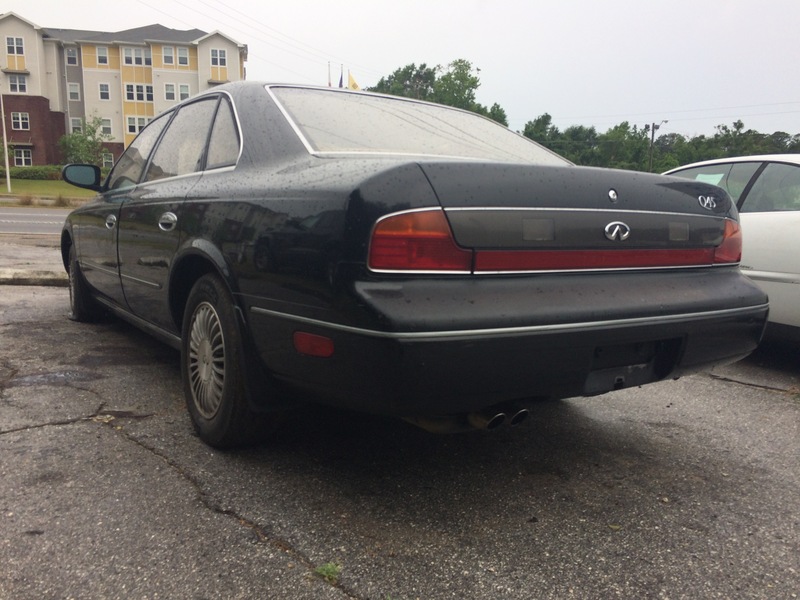 The Infiniti Q45 went from suavely understated to staid and anonymous with the 1994 facelift. Before, it was easy to pick out the alien face of the Q45 among the trifecta of Japanese flagship luxury cars (Lexus LS, Acura Legend, and the Infiniti). It had two, wide oval lights and an Inifinit logo on the flat surface between them; it was an odd look for a car to not have the grill as the centerpieece of the design. This visual strangeness, along with the much criticised initial advertising, undoubtedly limited the success of the Inifiniti. By 1994, the Infiniti had a grill in the traditional sense and revised, wraparound headlights. The conformist look also consisted of an upright, chrome waterfall grill barren of any defining insignia. It was extremely anonomyous and remains hardly distinguishable as an Infiniti to the uninformed. It looks like any generic Japanese full-size car of the time appearing much like the Mitsubishi Diamante. The restyling was unfortanate because, as you come around the back of the car, its smooth curves and well-done proportions come into focus. The stale, overly formal front end nearly overcomes the subtle lines and deatiling of the rest of the car. The interior is a typical luxury car of the period, I believe the criticism citing sparten accomodations was unfounded. It felt spacious and looked resonably nice with an analog clock and warmly colored surfaces. Yet it couldn’t help but date itself with the curved shape of the dash. Even with strong performance from a 4.5 liter V8 and very forward-thinking engineering efforts, Nissan’s flagship never seemed to have gained the status of the LS400 and Legend. By now, it has faded completely into the background of used car lots. This daring attempt at striking success in that era of lavish luxury from Japanese automakers looks like its hideing shamefully behind an uptight, unsuspecting face. I have a soft spot for the Mopar M-bodies like this Chrysler Fifth Avenue; there’s something appealing in its stubborn traditionalism. In the junkyard, the car called to me like a boxy, vinyl-topped beacon. I had to look while I could, knowing that Fifth Avenue sightings are increasingly fleeting. The car was bigger in person than I thought it would be, this being the smallest of the American full-size offerings of the time and based upon the Plymouth Volare/ Dodge Aspen compacts. I pulled up on the door handle and saw the rose red and warm woodgrain of the interior. The button-tufted velour felt soft yet springy, undoubtedly a plush place to sit. The steering wheel was of that familiar design Chrysler used in the 80s with the two spokes pointing to the bottom of the thin rim. The shining pentastar emblem in the center made me wish Chrysler displayed it as prominently today. Chrysler made some of the more interesting radio designs during the 80s-90s, the one in this Fifth Avenue looking slick with a shining metallic face and techy fonts. Before I shut the door, I grabbed the end of the column shifter and imagined dropping the three speed TorqueFlite into drive. I lifted the hood which sprung up nicely; why do we bother using prop rods and hydrolics? A messy a dirty 318ci LA V8 was what I saw and what powered all of these M-bodies towards the latter end of production. It wheezed out 140hp but make up for it with 246 pound-feet of torque. Its an imposing car; the fender louvres, shining grill, and quad headlamps with turn signals atop project sinisterness. Perhaps what really makes this car stick out is simply age. Its creased angularity, common 33 years ago when it was made, is far removed from the smooth curves of the sheetmetal surrounding it. No obvious concessions were made to aerodynamics in the pursuit of formality. I walked away from the big, white chrysler, feeling sad the forlorn relic will never again see the road. It looked striking and dignified even as it sat doomed in the junkyard. Among many enthusiasts is the notion that Wranglers stopped being good when Jeep went to the JK platform in 2006; likely a similar feeling to what Jeepers thought in 1987 when the YJ replaced the CJ-7. The square headlights and bent grill of the YJ must have been what the plastic fenders and V6’s mean today in the JK. Those who malign the JK embrace the preceding Wranglers. However, there is a little bias against the square headlights of the YJ regardless of however good the vehicle underneath is. For this, the YJ has been overshadowed by the succeeding TJ (1997-2006), yet it is still a quintessential classic Jeep in ways that the JK can’t replicate. Everything is metal on a YJ, despite the fact it originates from the late eighties and nineties. The grill is metal, the fenders are metal, and the tub has familiar slab-sidedness and gentle curves around the rear corners. It has exposed screws, wipers that haphazardly just lay across the windshield, and the top-heavy, nearly rickety, profile that ended with the JK. On the right rear corner of Wrangler, the magic words, “4.0L High Output” can be seen on models built after 1991. But back to that later; the YJ initially got off to a shaky start in its introductory year of 1987. It had a messily-designed plastic dash that replaced the flat metal unit in the CJ and a couple of weak, carbureted engine choices, the AMC 258 cubic inch straight six and the 150 cubic inch AMC inline-four. The 1987 Wrangler looked far removed from the CJ; it sat lower and wider for increased stability. But most noticeable and what was considered sacrilege to the more dedicated fans were those square headlights, they seemed to corrupt the familiar face of the Jeep in some eyes. By being the replacement for the CJ and by having those controversial headlights, the YJ has an inescapable stigma of not being a worthy successor to the CJ. The 4.0-liter inline six had multi-point fuel injection, and, in the Wrangler, produced 180 horsepower and 220 pound-feet of torque. With this engine, the YJ makes all the classic Jeep noises and the torque seven-slot hearts desire. It has two leaf-sprung solid axles, probably the last light-duty vehicle to have them. The interior is a lot more comfortable than it has any right to be, it’s a sparse box with slap-dash design. But thanks to its proportions, the YJ feels very capacious. There are no airbags to worry about, just a wide, thin rimmed steering wheel with three stainless steel spokes. It has the high doorsills, and thin doors that swing open and closed lightly and freely. The mirrors are spindly, vertically oriented rectangles. It’s unmistakable for anything else. In the age of the CJ, the YJ likely looked like a soft caricature. Square headlights are still brought against it, even today. That aside, the YJ is a premier example of what a classic Jeep is. It immerses you in an experience that personifies what the JK tries to be. It is an elemental and unique machine with the pull, roar, and sheet metal people have known and loved. Purposefully lean would best describe mini-trucks, the delightfully small and utilitarian compact pickups of the mid nineteen eighties and before. This Ford Courier, a Mazda rebadge, was produced from 1977 to 1983 in the thick of the mini-truck era. It sits low with no off road or macho pretense, has skinny, small diameter steel wheels with dog-dish hubcaps, and uncluttered, upright styling. This truck is a tool, its for hauling things, in this case a small trailer. Just look at that cab to bed length ratio. Most pickups you will see today have this ratio the other way around, with the cab longer than the bed. The exterior is almost architectural in its design, with unabashed angularity and functionality. Grasp the metal handle and thumb down on the push button to swing open the light metal door. The interior is like the inside of a thin metal box, because that’s exactly what it is. There’s a little style in the way the red of the vinyl upholstery meshes with the black metal and plastic surroundings, but that’s obviously secondary to the overall function. The wispy thin two-spoke steering wheel has no pretensions other than to guide the truck it is attached to through a worksite. A tall, thin, spindly shift lever juts straight out of the transmission tunnel in front of the bench. This Ford Courier is a tool, but can’t tools be just as fun as toys. There’s a sense of superficiality in the pickups of today; they try to mask their working origins in gluttonous size and power. Modest trucks like the little Courier, which have only the barest essentials to do the work trucks were meant to do, are refreshingly pure. In Limited trim, the Jeep Grand Cherokee represents the best of what SUVs were in the 1990s. This decade, a sweet spot for SUVs, was a time between the watered-down vehicles following and the elemental vehicles of prior years. 1994, the year of the featured Grand Cherokee, was also a year in which the last vestiges of traditional American luxury still had influence in automotive design. Enter the pillow topped tan seats, gold-trimmed lattice wheels, gold emblems, and fake plastic wood of the Limited. The first generation (ZJ) Grand Cherokee arose from the AMC era with the Concept 1 of 1989, but unlike the XJ Cherokee, reeks of design principles defining the contemporary Chrysler. Those surprisingly stiff, yet luscious-looking leather seats look at home in any puffed-up K-based Fifth-Avenue. The overhead console, with its green dot-matrix computer, looks like nothing but Chrysler. What made the ZJ great was the dimension of substance in combination of its fanciful accoutrements. It had two coil-sprung solid axles and, of course, the soulful and stout 4.0 liter inline-six. The powertrain was longitudinal, as it should be in an SUV, and transfer cases offered low range gearing. It had a Uniframe design, common to all closed Jeep SUVs in the 80’s and 90’s, that unified the frame and body into a single structure. The exterior is, in essence, an XJ Cherokee of larger dimensions with more concave sides and rounder edges. Square headlights and taillights have a stacked look to them, but are flush and smooth with the tidy body. The Limited in particular has prominent gold colored strips on the monochromatic bumpers and ribbed cladding; who can’t love a little bit of flash. The interior is posh with the squishy flat seats but unlike many classic SUVs, has appreciably spacious and efficiently designed accommodations. The gold theme continues with a 120 watt Infinity Gold stereo. Nearly everything was perfect about this pure white ’94 ZJ. The paint, often peeling down to the bare metal on these, shown dazzlingly bright against the cold drizzle. Doors shut tightly and easily; aside from some cracked leather, it was free of the buy here pay here aura of impending death by neglect. But unfortunately, being a ’94, the engine spins a dubious Chrysler four-speed as opposed to the rock-solid AW-4 four-speed in 1993. At over 180 thousand miles, it could have only so much life left. But this perfect example of what is, on paper, the perfect SUV has a fresh transmission ready for the years and miles to come. The 1997 Buick Century and Regal were both the last of their nameplates, at least until the Regal was reintroduced in 2009. Both vehicles were essentially the same but they had there own distinct flavors, the Regal being the sportier and more expensive of the two. The aim of the Century seems to be quite the juxtaposition to the relatively daring Regal, giving buyers more traditional virtues as opposed to the Regals more international qualities. Being impervious to most trends, fads, and gimmicks over its development and long life, the Century was able to be what would seem to be the quintessential modern Buick and an especially stress-free midsize sedan. Identifying a Buick of this generation as a Century or Regal starts at the front. The Century has a blunt nose with an upright waterfall grill and two wide, rounded headlights, thereby distinguishing itself from the relatively swept shape of the Regal. The staid Century has few sheet metal garnishes, but those that are there break up the rotundity. Conservatively applied also is chrome trim found on the grill, script nameplates, and around the rear light bar. The tested Century rode on a set of purposeful-looking black steel wheels with wheel covers. The unpretentious design of the Buick is most definitely reserved, but because of that continues to be worn well and proves quite likable. The interior of the Century is as refreshingly plain as the exterior with a monotonous expanse of grey in the case of the tested car. This may not sound positive, but just like occasionally choosing vanilla over chocolate ice cream, it nice to experience restraint and neutrality. The dash is defined by gentle curves and well-marked switchgear. 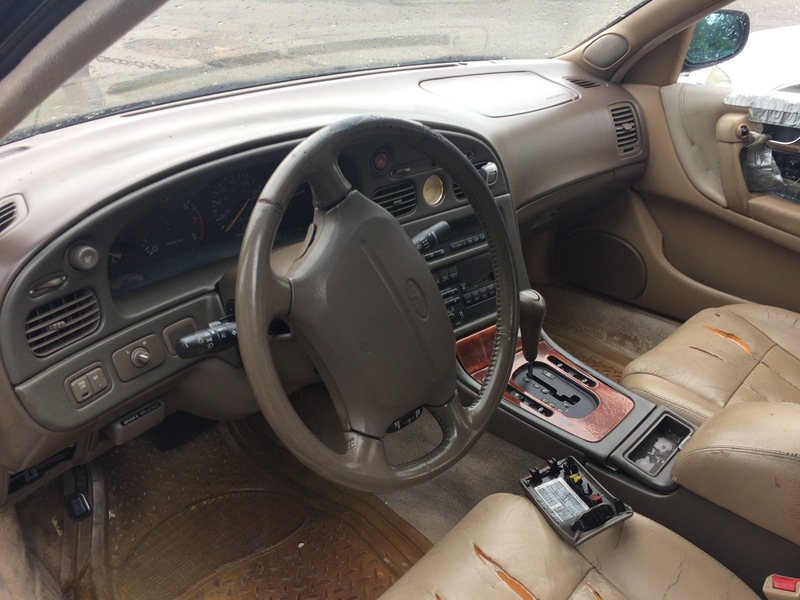 The lack of a true center console leaves a vast expanse of space under the dash contributing to the overall airiness of the interior. The velour 60/40 split bench seat is incredibly soft, giving the perception of an infinite amount of give in the cushion. Behind the dated four-spoke steering wheel is a simplistic instrument cluster consisting of a center speedometer, temperature gauge, and gas gauge. Other information is relayed through large warning lights. Trunk space is a more than decent 16.7 cubic feet. Buick made for a calming driving experience in the Century by keeping outside disturbances to a minimum. The compliant suspension quashes the resonance of impacts and the harshness of a poor road with competence while the cabin is tightly wrapped in a sheath of silence, isolated from wind noise and tire roar. The absence of hardly any impact along with the quiet acoustics enhances the surprising feeling of solidity in the tight-feeling Buick. The steering is rather heavy for such a comfort-oriented automobile, but is direct and responsive. Not responsive is the 3.1 liter pushrod V6 producing 175 horsepower and 195 pound-feet of torque. Centuries made before the 2000 model year had 160 horsepower and 185 pound-feet of torque. This engine puts power to the front wheels through a four-speed automatic with a column mounted gear selector. For any sort aggressive acceleration, the V6 requires some persuasion; otherwise it lazily propels the car to speed, emitting harsh, throaty notes in the process. Though the power train is far from ideal, it is adequate for the relaxed Century. The driving position is considerably flawed; the accelerator is far away while the steering wheel and the brake are close, but the Century makes up for this discomfort with its other previously discussed qualities. The brakes were neither grabby nor too spongy. The Buick is rated by the EPA to get 18MPG city and 26MPG on the highway, good numbers from a larger V6 sedan. The Buick Century adheres to the tried and true values that defined past American sedans and has its own appeal because of that. Even if the motor may be neither smooth nor spritely, an excellent ride and comforting interior ensure the Century can create a most serene driving experience. Kelly Blue Book says the fair purchase price for a 2003 Buick Century with the average of 115,495 miles is $4,296. For that price, rest assured your buying a likable Buick with luxuries and traditions that count.